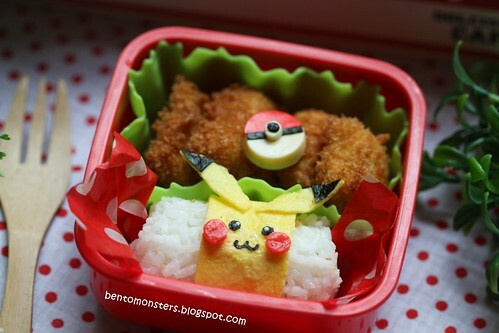 The bento for today is Pikachu, made out of egg sheets. I am planning to make Doreamon this week, so I made some blue/red/yellow egg sheets yesterday and kept them in the freezer. 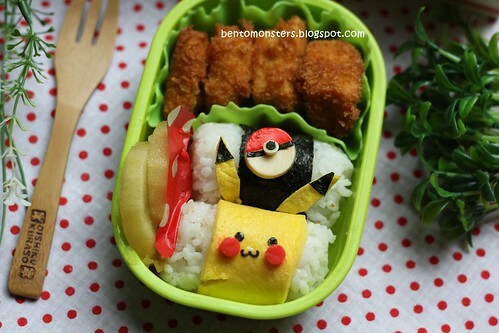 I was wondering what other characters I can make with the balanced egg sheets and Pikachu came to mind, so it's Pokemon theme bentos for today. :) The Pokemon ball is made out of cheese and nori, red portion was sprayed on with Wilton color mist. LT's bento, with furikake onigiris and nuggets. I put his fruits in another bowl, coz there was not enough space. I need a bigger lunch box! Hello !! I am Kelyrin, I am from France ! 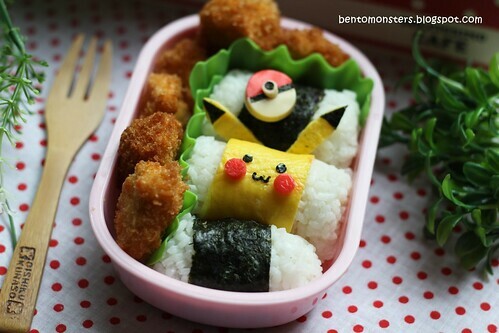 I was looking for pikachu bento tutorials, because I was planning on making another one pretty soon, and I found your website, which i didn't know at all !!! I'm so happy that i found it, your pikachu is absolutely beautiful, now I can go to your first page and look at your different bentos :) !!! !